Once again, students from the delta compete in the Lego Robotics contest.I had the honor of being a referee/judge. Next year I want an official striped shirt. These are some of my students from Tununak competing. Here is a snippet of an article from the Delta Discovery Click the link to read the entire article. 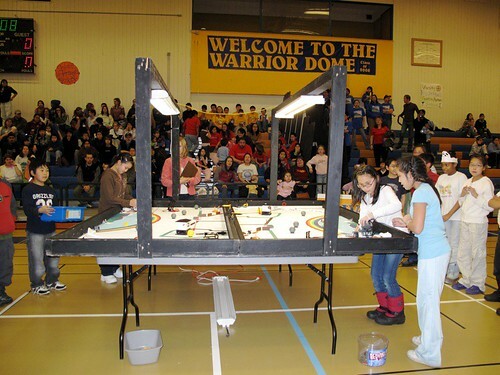 “Eighteen robotics teams participated in the 2008 Alaska Southwest Regional Robotics Competition in Bethel last Friday and Saturday, sponsored by the Lower Kuskokwim School District. Every year, First Lego League works with experts in the field to create a Challenge that relates to a significant real-world issue. The end result is a two-part Challenge that requires research to complete. The theme of this year’s competition is “Climate Connections”. Teams embarked on an exploration of the earth’s climate, discovering the links between science, people, resources and communities. Students also researched how we learn about past climates and delve into questions surrounding our current and future climatic conditions. Learning about the Arctic snow pack and how an aqua dome can be used to help plants grow was part of the Ayaprun Elitnaurvik Guskimos team project. “Working with the team was the best,” said team member Aiden Kuhne, age 9, while cheering enthusiastically for the other teams in the pit area. His team won an award for their project and research.